Next Best Start in Life courses are going to start on: Wednesday the 27th of March at 5:45 pm (*** fully booked) and on Friday the 5th of April at 7 pm (*** fully booked). It is a 7 weeks course with the first class being for the owners only. All the puppies need to have their first vaccination to attend the classes and not be older than 16 weeks at the start of the course. The maximum number of puppies in each group is 7. To view the full program and location of my classes please click here . To find out more or to book a place please contact us via website or give me a call. Due to high demand we have decided to start an additional 7 weeks long Level 1 Puppy Classes (Best Start in Life) on Friday the 25th of January at 8:15 pm. This is a course designed for puppies up to 4 months of age. The cost of the course is £80. For more information or to sign your puppy up please contact Millie Brander who will be running this class. There will be two new 8 weeks Level 2 Puppy Classes including The Kennel Club Puppy Foundation Assessment starting in January: on Wednesday the 9th at 7 pm (***fully booked) and on Thursday the 10th at 8:15 pm (***fully booked). The Thursday course will end a week later than it should (on the 7th of March), because I am away on the WOOF! conference on the 7th of February. This is a course designed for puppies between 4 and 7 months of age (at the start of the course). The cost of the course is £100, that includes 1 hour class once a week and e-mail after each meeting with description of the exercises introduced during the class and some general additional information on dog training. Please get in touch if you have any further questions or would like to secure a place for your puppy. My assistant, Millie Brander, has kindly agreed to run one more Level 1 Puppy Training and Socialisation Classes staring on the 19th of October at 8:15 pm. Program, location and price of the course are the same as at my classes, just the number of puppies in the group will be slightly smaller (maximum 5 dogs). To book a place please get in touch with Millie, she will give you all the details. We are proud to announce that we will be hosting a two days seminar on Canine Communication on the 27th and 28th of October. Our guest speaker has incredible knowledge on dogs' body language, social behaviours and communication (dog to dog, dog to human and probably most important human to dog) gathered over the years of attending and organising Communication Classes both in Italy and Poland. It is going to be a fascinating weekend full of information supported by video footage that will help you better understand your dog and what closely follows - build a stronger bond and closer relationship with you four legged family member. For more information (the full program, information about the speaker, location and prices) please visit our Facebook Page or simply get in touch. Due to a high demand we have decided to start two more puppy classes in October. The 6 weeks Level 1 will start on Friday the 5th of October at 7 pm and the Level 2 on Sunday the 7th at 5 pm. Because we are using the hall for the Canine Communication Seminar (https://www.facebook.com/events/207935439840008/) on the 28th of October the course will end a week later than it should, on the 2nd of December. The classes will be run by my assistant and student trainer Millie Brander. The program, location and price will remain the same, just the number of puppies in the group will be slightly smaller, maximum 5 dogs. I will not be present at the classes. To book a place please contact Millie through her website. We are going to start two new Level 2 Puppy Classes including The Kennel Club Puppy Foundation Assessment in October. Wednesday the 10th at 7 pm (*** fully booked) and Thursday the 11th at 8:15 pm (*** fully booked). It is an 8 weeks course, but because we are also organising other events this Autumn two of the Thursday classes will have to be cancelled - the 25th of October (Canine Communication Seminar: https://www.facebook.com/events/207935439840008/) and 15th of November (Mantrailing Workshop) the Thursday course will end a bit later than it should, on the 13th of December (more time to practice! ;) This course is designed for puppies between 4 and 7 months of age. 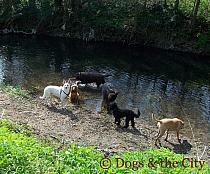 The classes are held in small groups, maximum 7 dogs. We are meeting once a week for an hour and after each class all the participants receive and e-mail with description of the exercises done at the class and some additional information on dog training. Contact us if you have any questions about the course or would like to book a place for your puppy. We are going to have two Kennel Club Bronze Award classes ending with an exam. It is an 8 weeks course for dogs over 7 mo who already had some basic training. The classes will start on Tuesday the 9th of October at 8:35 pm (*** fully booked) and Wednesday the 10th of October at 8:15 pm (*** fully booked). One of the Tuesday classes (on November the 20th) will have to be cancelled due to a workshop organised by Dogs & the City, so the whole course will end one week later than it should. Please don't hesitate to get in touch if you'd like to find out more about The Kennel Club Good Citizen Scheme. The next 6 weeks Best Start in Life course will start on Wednesday the 10th of October at 5:45 pm (*** fully booked). We will be meeting for an hour once a week. After each class all the participants will receive an e-mail with descriptions of exercises done during class and some additional information on dog training and raising puppies. Please get in touch if you have any questions or would like to sign your puppy up. It is a course designed for puppies up to 16 weeks of age (first vaccination is required). BEST START IN LIFE: 6 weeks course for puppies from the first vaccination to 16 weeks of age (at the start of the course) - Wednesday the 16th of May, at 5:45 pm (*** fully booked) and 7 pm (*** fully booked). Maximum 7 puppies in a group. LEVEL 1 / KC PUPPY FOUNDATION ASSESSMENT: 8 weeks course for puppies between 4 and 7 months old - Wednesday the 16th of May at 8:15 pm (***fully booked) and Thursday the 17th also at 8:15 pm (*** fully booked). Maximum 7 puppies. LEVEL 2 / BRONZE GOOD CITIZEN: 8 weeks course ending with The Kennel Club Good Citizen Scheme Bronze Level Assessment for dogs who are at least 7 months old and already have had some basic training - Tuesday the 15th of May at 8:35 pm (*** fully booked). The maximum number of dogs = 6. Here you can find the location and program of my classes. Please get in touch if you have any questions or would like to book a place for your puppy. Please bare in mind that due to a mantrailing week we are organising in June there will be no classes on the 13th, 14th and 19th of June and all the courses will end a week later than they normally should. There will be two Best Start in Life courses starting in March. One on Wednesday the 14th of March at 7 pm (*** fully booked) and one on Friday the 16th also at 7 pm (*** fully booked). Number of places is strictly limited to 7. The cost of the course is £60. This course is designed for puppies from the time of their first vaccination up to 16 weeks of age. If you'd like to book a place please contact me either through my website or on Facebook. There will be a Level 1 Puppy Training and Socialisation Classes staring on the 14th of March at 8:15 and The Level 2 Puppy Classes ending with the Bronze Good Citizen Assessment starting on the 15th of March at 8:15 pm. Both courses are now fully booked. There will be more Puppy Classes - all levels: Best Start in Life, Level 1 and Level 2/Bronze Good Citizen - coming mid March, but I don't know the exact dates yet. I will post all the information about them here at the end of January :) Thank you for your patience. There will be an 8 weeks long course preparing for The Kennel Club Good Citizen Scheme Bronze Award starting on the 7th of January at 5 pm (*** fully booked) and classes preparing for the Silver Level Assessment starting on the 9th of January at 8:30 pm (*** fully booked). Here you can find the location and program of my classes. Please get in touch if you'd like to enrol your dog to either of the classes. There will be 4 new courses for puppies starting in January. Two groups for very young pups (Best Start in Life) and two for a bit older puppies (Level 1 Puppy Training and Socialisation Classes). The 6 weeks Best Start in Life (for puppies between 8 and 16 weeks of age at the beginning of the course) will start on Wednesday the 10th of January at 7 pm (*** fully booked) and Friday the 12th of January also at 7 pm (*** fully booked). The 8 weeks long Level 1 Puppy Classes (for puppies between 4 and 7 months old) will start on Wednesday the 10th of January at 8:15 pm (*** fully booked) and Thursday the 11th of January also at 8:15 pm (*** fully booked). Here you can find the prices. Please get in touch if you'd like to book a place on one of my courses. There will be two courses preparing for The Kennel Club Good Citizen Scheme Bronze Award starting on the 1st of November (Wednesday) in the evening, at 7 pm (*** fully booked) and 8:15 pm (*** fully booked). You can find the program for this classes here (Level 2 Puppy Classes). Please contact me if you'd like to book a place for your dog :) Basic obedience is required to attend this course. There will be more Puppy Training and Socialisation Classes in June, but I will post the exact dates here at the end of April, so please keep an eye on the News section and get in touch when you see the date that suits you or if you'd like to meet for private consultations beforehand. I am very sorry, but I need to stop accepting new clients for 1-2-1 training until the end of the month. I am simply too busy at the moment. I have to save some time for my current and 'old' clients for the next few weeks. Please get in touch in April if you need a private consultation and you don't mind waiting. Please get in touch if you are interested in any of the classes. There will be two new Level 2 courses coming soon. One will start on the 20th of April at 8:15 pm and the other on the 3rd of May, also at 8:15 pm. These classes are available for all the dogs who are under 1 year old and either attended my Level 1 Puppy Classes or did the program of the class during private sessions. Each course lasts 8 weeks and costs £80. It will end with The Kennel Club Good Citizen Scheme Bronze Award or Puppy Foundation Assessment for those who don't have it and aren't ready to take Bronze Level yet. Here you can find a detailed program of the classes. Please get in touch to book a place. New starting dates for the Level 2 Puppy Training and Socialisation classes are: Wednesday the 4th of January 2017 at 7 pm (*** no places left) and Thursday the 5th of January at 8:15 pm (*** 1 place left) . The class is available to all the puppies who have graduated form my Level 1 Puppy Class and are under 1 year of age. The course takes 6 weeks (1 hour a week) and costs £60. Here you can find the program. We are taking bookings now, so please don't hesitate to get in touch if you'd like to enrol your puppy. Just please bare in mind that I am away for a week in January, so there won't be classes on the 25th and the 26th. The course will end on the 15th and 16th of February. My walks are full now, no available spaces left. Will post it here if anything changes. I'm afraid I have to stop accepting new clients for individual training sessions due to other commitments and lack of time. I will post it here, in the News section, when I am ready to start doing them again. Saying that I will still be meeting my existing clients on 1-2-1 basis when they need it. One place on the midday group walk Mon - Thur still available. The next 6 weeks Level 2 Puppy Course will start on Thursday the 10th of March at 8:15 pm. Click here to check the program. The Level 2 is only available to puppies who have completed my Level 1 Puppy Classes. Because this groups has filled up so quickly I have decided to start another Level 2 on the 6th of April at 7 pm. The next 6 weeks Puppy Training and Socialization classes will start on the 24th of February (Wednesday). There will be two courses starting the same day, one at 7 pm (*** no places left) and one at 8:15 pm (*** no spaces left). Each class takes an hour and there is 15 mins break between classes. The course costs £60. After each week every participant receives an e-mail with all the stuff we covered at the class with some theoretical information on dog training, canine learning, body language and communication etc. To find out more about the program of the course please have a look here. Do not hesitate to contact me if you would like to book a space for your puppy or have some questions regarding the course. Looking forward to hearing from you! I'm afraid there is no more available spaces on our group walks. There is no more spaces available on any walks apart from Monday at noon and possibly Friday if necessary, but only as a second walk for the dog that will join us on Mondays. To see the photos from the walks, please visit my gallery :) And here you can find the prices. Due to my dog's illness I am taking a break from private sessions, so I am not accepting new clients for 1-2-1 training at the moment. I need to focus on him right now, but I will post here as soon as I am ready to go back to working full time and can do individual training again. I am very sorry for the inconvenience, but I hope you will understand. I am still doing walks and group training classes. I am very sorry, but at the moment I am not accepting any new dogs for the Obedience Classes for adult dogs on Thursday evenings. The next 6 weeks Puppy Training and Socialization Classes will start in the evening of 09.07.14. For the location and the program of the course please look here. If you have more questions about the course or would like to enroll your puppy please contact me on my phone or via e-mail. I am looking forward to hearing from you! :) ***There is no places left on this course. The class is full. I'm sorry but there is no more places available on the Level 1 Course starting on the 18th of June, the group is full. Next 6weeks Puppy Training and Socialisation Classes held in North of Edinburgh will start on the 18th of June at 8:15pm. For more information please contact me on gosia@dogsandthecity.co.uk or have a look here. Spaces are strictly limited to 5 puppies and are allocated on 'first come first served' basis. I'm going to Poland for Christmas (leaving tomorrow) so won't be able to answer phone calls until the 30th of December. If you'd like to contact me to book a training session, ask about dog walking or have any other enquiries, please send me an e-mail on gosia@dogsandthecity.co.uk or a message on my facebook page. And for now MERRY CHRISTMAS EVERYONE! Dogs & the City is now serving Edinburgh, Fife and the Lothians! Dogs & the City began in London in 2009 offering dog walking, dog training and small pet care services. Since then the company has grown and now in 2013 is opening a new branch in Scotland. At the moment we offer one-to-one training sessions and behaviour consultations as well as home visits for other furry members of your family while you’re away. Gosia Lehkunow doesn't work for Dogs & the City London anymore. She's moving to Fife and will be opening a Scottish branch of D&tC soon :) From now on Magda Szachniewicz will be looking after our London clients, so please contact her if you need help with walking or training your dog. IMPORTANT: I’m moving away from London in few weeks, so I’m not accepting new clients for trainings sessions anymore. Next 6weeks Puppy Classes Course will start on the 24th of June at 7pm. For more information please contact me on gosia@dogsandthecity.co.uk Spaces are strictly limited to 6 puppies and are allocated on 'first come first served' basis so pease do not hesitate. Next PUPPY CLASSES course will start on the 18th of March (Monday, 7-8pm). You can find more information here: http://www.dogsandthecity.co.uk/puppy-training And if you have any quesitons, contact me on gosia@dogsandthecity.co.uk And please do not hesitate because the places may be taken long before the course starts. 3 years old Boxer Cross looking for a new home. For more information please visit my facebook page: http://www.facebook.com/photo.php?fbid=10151405008354664 &set=a.10150744641719664.465079.91600004663 &type=1&theater The dog is not staying with me, his foster mom's name is Kim and the phone no is 07900 898953. Please contact her about the adoption. Next Puppy Classes will start on Monday 21st of Janury!!! Finally! My mail box is working again. Finally! My mail box is working again. I replied to all the e-mails I've received over the past couple of weeks, but please contact me if you haven't got an e-mail from me. And once again I apologise for all the inconvenience. I’d like to apologise to everyone whom I haven’t replied, but for some reason I cannot log in to my mail box since I came back on the Saturday night. I’m working on it and promise to contact all of you as soon as I manage to fix the problem. Once again I am very sorry for the inconvenience. Please note that I am abroad from 10th till 17th November without an access to mobile or e-mail. I will reply to your e-mails upon my arrival. The November group is already full. The next puppy classes course will start on Monday the 7th of January 2013 at 7pm. You can enrol your puppy now :) You can find more information about my puppy classes here. Another PUPPY CLASSES course will start on 5th of November at 8:15pm and this is going to be the last course this year. The next one will start on the 7th of January, so don't hesitate - enrol your puppy asap. Spaces are strictly limited to 5 puppies and are allocated on 'first come first served' basis. The next PUPPY TRAINING AND SOCIALIZATION CLASSES course will start on the 15th of October!!! If you are a proud owner of a puppy I would like to invite you to my puppy classes. I hold 6 weeks courses in Leytonstone on Monday evenings, so please get in touch if you are interested. There is no more than 5 puppies in a group and places are booked on the "first come, first served" basis, so don't delay, if you plan to attend. The cost of the whole course is £100. Next PUPPY CLASSES course will start on the 3rd of September at 7pm in Leytonstone. There are still two places left in the group so please contact me if you're interested in training your puppy with us. If the 3rd of September is too early for your dog (all puppies have to be after their second vaccination) you can already enrol on the course that will start few weeks later, on the 24th at 8:15pm. I am currently taking a break from individual training to allow myself to concentrate on my canine behaviour degree, therefore I will not be accepting new clients for a month. If you are interested in 1-2-1 training, please contact me after 20th August 2012. I apologise for inconvenience. I'm away from 4th to 11th of June. Won't be able to answer the phone. You can still send me an e-mail, just please be patient, I will reply after I come back. Sorry for the inconvenience. The group starting puppy traning classes on Monday, June the 11th, is now full. The group starting puppy traning classes on Monday, June the 11th, is now full. I'm sorry if you didn't manage to enrol on time, but there are still individual traning sessions if you need help with your new puppy. There is just one place left on Puppy Classes starting on the 11th of June. All three groups on Sunday training classes for adult dogs are full. All three groups on Sunday training classes for adult dogs are full, but we can always meet on the private session(s). To find out more, please read http://www.dogsandthecity.co.uk/price-list. There is no more free place on the group walks. There is no more free place on the group walks, both groups are full. But please contact me if you'd like to put your dog on the waiting list. Another PUPPY TRAINING AND SOCIALIZATION CLASSES course will start on the 11th of June!!! If your puppy is too young to attend on the upcoming course and won't have the second vaccination before the 21th of May, don't worry, you can already enrol on the next course which will start on Monday th 11th of June. The course takes 6 weeks, is held in Leytonstone and costs £100. For more information please visit my website puppy classes. This is going to be the last Puppy Classes Course before September, so don't hesitate for too long. Places are limited. I would like to apologise everyone who have tried to contact me by e-mail since the end of March and have not recieved a reply. I was not aware if the fact that my contact sheet was not working properly and did not forward messages to my inbox. Should you still need my services you are more than welcome to get in touch again! I owe the biggest apologies to those whom I particularly asked to email me for details when I spoke to them on the phone. If you are a proud owner of a puppy I would like to invite you to my puppy classes. I hold 6 weeks courses in Leytonstone on Monday evenings, so please get in touch if you are interested. There is no more than 5 puppies in a group and places are booked on the "first come, first served" basis, so don't delay, if you plan to attend. The next course will start on 21st of May 2012. If you are a proud owner of a puppy I would like to invite you to my puppy classes. I hold 6 weeks courses in Leytonstone on Monday evenings, so please get in touch if you are interested. There is no more than 5 puppies in a group and places are booked on the "first come, first served" basis, so don't delay, if you plan to attend. The next course will start on 30th of April 2012. No places left on the Sunday obedience classes for adult dogs. All three groups are full. I'll let you know when something changes. I'm very sorry if you didn't enrol on time, but if you're having some problems with your dog, if you think you could both benefit from some training, we can always do an individual (1-2-1) session. If you are a proud owner of a puppy I would like to invite you to my puppy classes. I hold 6 weeks courses in Leytonstone on Monday evenings, so please get in touch if you are interested. There is no more than 5 puppies in a group and places are booked on the "first come, first served" basis, so don't delay, if you plan to attend. The next course will start on 2nd of April 2012. Open drop-in basic and intermediate obedience classes for older dogs! I run open drop-in basic and intermediate obedience classes for older dogs on Sundays at 11am (intermediate) and 12.30pm (basic) in Wanstead Park - contact me for more details if you are interested in going beyond puppy basics. Recommended dog walker in Stratford area! My friend, Kasia of Freaky & Me, has recently opened her dog walking business in East London. She covers areas outside our patch, so if you live in Stratford, West Ham, Plaistow, Upton Park, East Ham, Bow or Mile End and you need a reliable and dedicated walker for your canine friend, get in touch with Kasia!